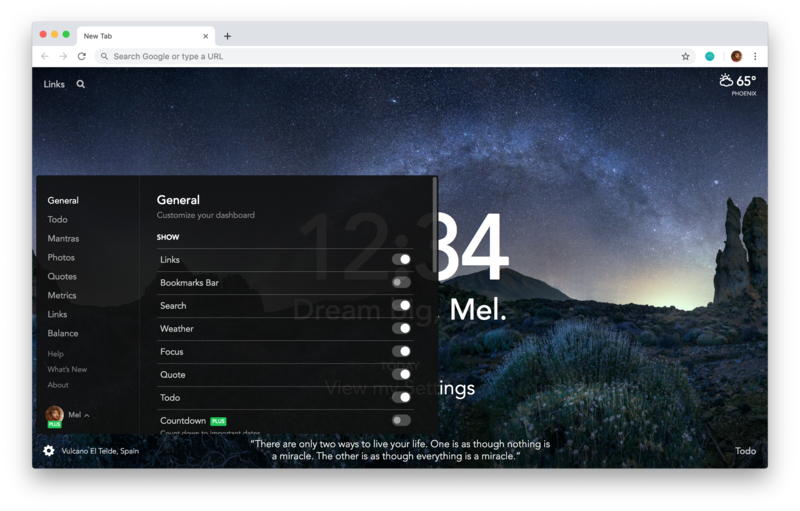 Momentum is a free browser add-on, available on Google Chrome and Firefox, that replaces your New Tab page with a peaceful and productive space for you to organize your life in. Join millions who are already using Momentum to stay focused, refreshed and inspired! In this help article, we're breaking down of each of the features that are available in Momentum. Feel refreshed each day with Momentum's beautiful landscape photos, encouraging mantras and uplifting quotes. Start each day on the right foot by entering the main thing you want to accomplish into the Daily Focus section at the center of Momentum. Momentum's simple Todo manager located at the bottom right corner of Momentum, lets you quickly add, track, and complete any tasks that come up during your day. Add your favorite and most visited websites to the Links section at the top left corner of Momentum for quick and easy access of your favorite websites. The Weather metric at the top right corner of Momentum displays your local weather information so you can keep a close eye on the current weather conditions. Momentum's search box is available at the top left corner of Momentum for you to conduct your daily searches. Momentum's clock automatically syncs with your computer's time. You can switch between the 12hr, 24hr, and Percent Clock formats. Momentum's Bookmarks Bar syncs with your browser's bookmarks, so you can view your existing bookmarks and most visited websites within Momentum. Use Momentum's Balance mode to provide yourself with a visual reminder of when it's time to rest or focus on other important areas of your life. Visit Momentum's Settings ⚙️ at the bottom left corner of Momentum to adjust or hide certain features, change the search provider, view your past or favorited mantras/photos/quotes, discover new benefits and more! Momentum Plus is an optional paid membership that unlocks additional Momentum features and customization options. Add countdowns, notes, world clocks, change your photos, mantras, quotes and more with Momentum Plus!